Gram-negative bacteria are enclosed by a defining outer membrane (OM) that functions as a permeability barrier, shielding the cell against harsh environments and protecting it against toxic compounds, including antibiotics. In fact, many antibiotics that are directed towards Gram-positives are ineffective against Gram-negative bacteria because they are unable to cross the OM and enter the cell (1). 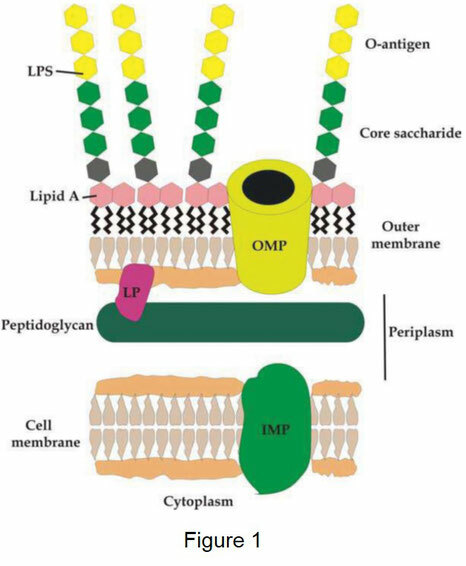 In contrast to most biological membranes, which are symmetrical, the OM is asymmetrical (figure 1 adapted from 2) with inner leaflet made up of lipids and an outer layer composed of glycolipids, mainly lipopolysaccharide (LPS). The role of LPS as potent immunogen is well established because it is a powerful stimulant of the innate immune system and is responsible for endotoxic shock as observed in sepsis caused by Gram-negative bacteria. LPS is a complex molecule made up of three different parts (figure 1). The lipid moiety – lipid A - anchors the molecule in the inner leaflet. This is a glucosamine disaccharide decorated with six or seven acyl chains, which are mainly saturated (1,3). This facilitates tight packing, thereby reducing the fluidity and preventing the passage of hydrophobic molecules. Lipid A is connected to a core saccharide, and an extended polysaccharide known as the O-antigen, of up to 200 sugars, which participates in interactions with the external environment and in particular the immune system (1,3). The O-antigen consists of repeating oligosaccharide units (O unit). These are made up of two to eight residues and include common as well as rare sugars. Lipid A and the saccharide moieties of LPS are synthesized on the cytoplasmic side of the inner membrane. At this site of the membrane, the core oligosaccharide is assembled onto lipid A after which the core structure is flipped towards the periplasmic face of the membrane. Following its synthesis, the O-antigen is also flipped across the inner membrane and is subsequently ligated onto the LPS core (3). In order to reach the OM, LPS must traverse across the aqueous periplasm. Complementary genetic and biochemical studies have identified seven essential proteins – LptABCDEFG - that are required for LPS transport (Lpt) from the periplasmic face of the inner membrane to the OM (4). The sorting of LPS to the OM starts with its extraction from the inner membrane by the ABC transporter LptB2FG at the expense of ATP hydrolysis. LPS is subsequently transferred to LptC and transported across the periplasm to the OM through a scaffold made up of LptA oligomers that associate with LptC. Conceivably, LPS translocation is powered by utilizing the energy from ATP hydrolysis by LptB2FG. At the OM, membrane insertion and assembly by LPS is facilitated by LptDE. This is a complex made up of two proteins, an integral membrane protein (LptD) and a lipoprotein (LptE). Recently, high resolution structures of LptD and E from different Gram-negatives were presented, providing profound insight into the molecular mechanisms of LPS insertion (5,6). Here, I will discuss the biochemical and structural properties of LptD and E.
LPS was first discovered by Richard Pfeiffer in 1894 as a toxic substance extracted from Vibrio cholerae and Salmonella typhi and termed endotoxin (7). Today, LPS remains one of the most intensely studied bacterial components, owing to its ability to elicit various biological responses such as the induction of fever. Another reason for the continued interest in LPS is its known chemical structure and the identification of its biosynthetic genes. All components of LPS are produced at the cytoplasmic face of the inner membrane and this process can be divided into four major steps (figure 2 adapted from 3), namely: (i) the synthesis of lipid A, (ii) the production of the core oligosaccharide and attachment onto lipid A, (iii) flipping of the core structure to the periplasmic face of the inner membrane and (iv) synthesis of the O-antigen and ligation onto the core structure. Lipid A is produced through the nine-step Raetz pathway, involving enzymes encoded by lpx genes (3). The core oligosaccharide comprises an inner and outer core region. This structure is assembled onto lipid A by sequential addition of sugar moieties through the action of the glycosyltransferases of the waa gene cluster. Subsequently, the LPS core structure is flipped to the periplasmic of the inner membrane by the ABC transporter MsbA (1,3). The core oligosaccharide serves as attachment site for the O-antigen. This structure is synthesized on a polyisoprenoid lipid on the cytoplasmic face of the inner membrane by one of three pathways (Wzy dependent, ABC transporter dependent and synthase dependent). Following its synthesis, the polyisoprenoid lipid flips the O-antigen to the periplasmic side of the inner membrane after which it is appended on the LPS core trough a reaction catalyzed by the ligase WaaL (3). Although LPS is essential for cell viability, some Gram-negative bacteria express truncated LPS chains at their cell surface. These lack the O-antigen and this is called rough LPS, while cells expressing wild-type LPS exhibit a smooth phenotype. Importantly, cells containing rough LPS display reduced immunogenicity (1). The sorting and assembly mechanism of LPS has been defined recently by complementary genetic and biochemical experiments. These have identified seven essential proteins – LptABCDEFG - that are required to transport LPS from the periplasmic face of the inner membrane to the OM (4). In the Gram-negative bacterium Escherichia coli, these proteins are localized to three different cellular compartments, namely: the inner membrane, the periplasm and the OM. The Lpt proteins assemble into a scaffold spanning the periplasm, enabling the transport of LPS from the IM to the OM. High resolution structures of all these proteins have been reported from different Gram-negatives (4), providing a mechanistic explanation for the extraction of LPS from the IM by the ABC transporter LptB2FG. LptF and G are transmembrane proteins, while LptB is a ATP binding protein that is peripherally associated with the IM. Following its extraction, LPS is transferred to LptC. This is a small transmembrane protein and associates with the LptB2FG complex as well as with the periplasmic protein LptA. This protein binds LPS and oligomerizes in the presence of LPS. It is thought that following interaction with LptC, a scaffold is formed made up of LptC, LptA oligomers and the N-terminal domain of LptD. This structure bridges the periplasm and functions as a slide, enabling the transport of LPS to OM with its lipid A moving along the hydrophobic groove of the slide. Conceivably, LPS translocation is powered by utilizing the energy from ATP hydrolysis by LptBFG. 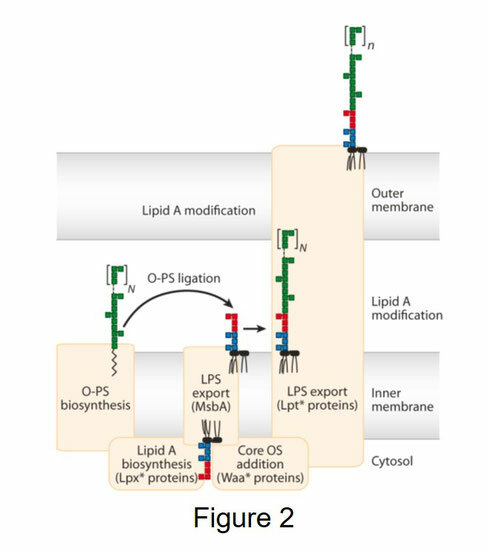 At the OM, insertion and assembly of LPS into the outer leaflet is facilitated by the LptDE complex consisting of an integral membrane protein (LptD) and a lipoprotein (LptE). The major steps in the sorting of LPS by the Lpt system are shown in figure 3 (adapted from 6). LptD is a β-barrel outer membrane protein (OMP) of about 89 kDa and was the first of the seven LPS transport proteins identified. It was implicated in maintaining OM integrity through a genetic screen designed to find suppressor mutations in E. coli cells with an increased OM permeability. Specifically, mutations in the gene encoding LptD enabled the survival of E. coli cells with a defective OM (8,9). This gene is located in an operon with surA, a periplasmic chaperone that is crucial for the biogenesis of OM proteins and this provides an important clue for LptD as determinant of OM integrity. Next, LptD was shown to be essential for E. coli viability and its depletion affects the localization of lipids and OMPs, thereby confirming LptD’s essential role in cell envelope biogenesis (10). Using Neisseria meningitides, in which LPS is not essential, it was shown that LptD is directly responsible for LPS assembly (11). To assess whether LptD is part of a protein complex, potential interacting partners were identified in pull-down experiments with LptD as bait. This revealed that LptE copurifies as complex with LptD from detergent solubilized outer membranes. LptE is a lipoprotein of approximately 20 kDa and is, similar to LptD, essential for viability of E. coli cells. Depletion of LptE results in defective cell envelope biogenesis as observed with depletion of LptD (12). The discovery of the LptDE complex in the OM raised important questions about the mechanism of LPS membrane assembly. Profound insight into the molecular details of this process was provided by recent LptDE structures of different Gram-negatives, including Shigella flexineri and pathogens such as Yersinia pestis and Klebsiella pneumonia (5,6). These are described below in more detail. The S. flexineri LptDE complex was the first to have its complete high-resolution structure solved at 2.4 Å (5). This OM-embedded complex is ~ 110 kDa and its structure is shown in figure 4, revealing a two-protein complex with a plug-and-barrel architecture (top left panel). LptD is folded into a cylindrical β-barrel made up of 26 strands (shown in green). In fact, LptD possesses the largest known barrel pore. LptD contains an extended N-terminus that is localized to periplasm and is composed of a short helix (in yellow) and a β-jelly roll domain (in blue) with each of the two β-sheets made up of eleven antiparallel strands. The interior of this domain is hydrophobic and it is therefore conceivable that it is involved in binding the hydrophobic moiety (lipid A) of LPS. In contrast, the inside of the barrel is mainly hydrophilic, favoring the accommodation of the charged polysaccharide moieties instead of lipid A. LptE (in orange) is localized into the LptD barrel. About 75% of LptE is located in the lumen of the pore, while the remainder is at the periplasmic side. The plugging of the pore by LptE decreases its volume towards the periplasmic side, although the LptD barrel is large enough to accommodate a truncated (rough) LPS molecule (5). β-strand 1 and 2 of the barrel (shown in red and pink of the center panel) contain conserved proline residues at position 231 and 246, respectively (shown in ball and stick representation) that reduce the number of main-chain hydrogen bonds and thereby disrupt β-strand 1 and 2. This creates a weak interface between β-strand 1 and 26 (in purple), suggesting that the barrel opens partially between these strands, which allows diffusion of lipid A into the outer leaflet of the OM (13,14). A hydrophobic surface representation of the complex (left bottom panel with hydrophobic residues in red and hydrophilic residues in white) shows a large cavity (indicated by a yellow star) between the N-terminal domain and β-barrel. Conceivably, a part of the N-terminal domain may be embedded in the OM to accept the hydrophobic part of LPS. LptE has been implicated in LPS export in addition to plugging the LptD pore and formation of the LptDE complex (13,14). LptE is made up of two α-helices and five β-strands (right bottom panel). The latter structure is thought to comprise the LPS binding site. Given its moderate hydrophobicity it seems likely that interacts with the hydrophilic part of lipid A. Based on this, it was proposed that upon leaving the LptD N-terminal domain, the hydrophobic moiety of LPS may directly enter the bulk lipid, while the more hydrophilic part of lipid A as well as the saccharide units enter the LptD barrel after which the entire molecule is inserted into the outer layer of the OM through the putative LPS exit portal (5). Recently, additional LptDE structures from different Gram-negative pathogens were reported (6). These include structures of the LptDE core complex from Yersinia pestis and Pseudomonas aeruginosa as well as a structure of the full-length complex at 4.4 Å from K. pneumonia, the causative agent of various infections, including pneumonia, in people with a weakened immune system. 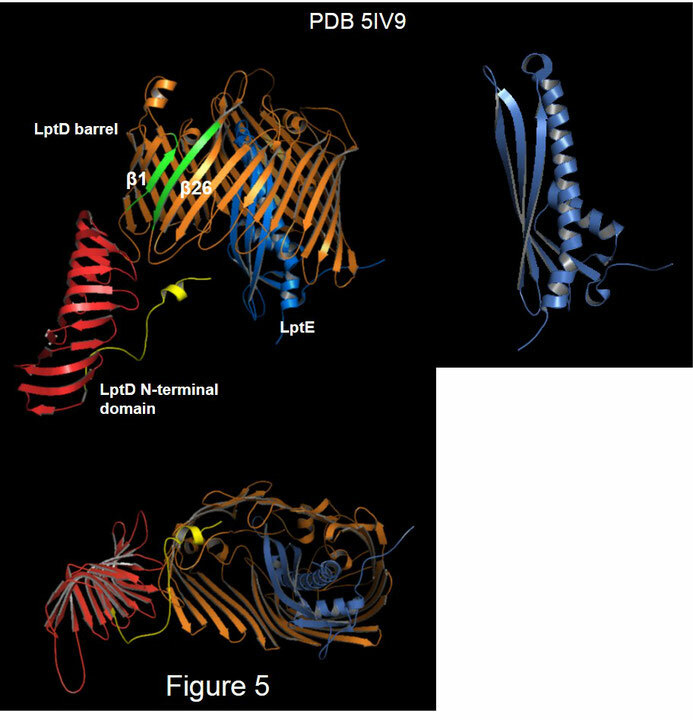 The structure of K. pneumonia LptDE is presented in figure 5 and shows that the complex is organized into a plug and barrel architecture as observed for the S. flexineri complex (top left panel), illustrating structural conservation amongst Gram-negative LptDE complexes. LptD contains a periplasmic N-terminal domain and a C-terminal transmembrane β-barrel (in orange). The N-terminal domain is made up of a short helix (in yellow) and a β-jellyroll fold (in red) that is arranged into a V-shaped hydrophobic groove that is predicted to line up with the groove of LptA. This domain is connected to the barrel via a flexible linker that allows small movements that could help maintain the structural integrity of the Lpt trans-envelope bridge. The LptD barrel contains 26 transmembrane β-strands that are at the periplasmic side connected by short loops and at the extracellular side by larger loops. LptE (in blue) is situated in the lumen of the barrel with its N-terminus protruding from the barrel towards the lipid-modified N-terminal cysteine that anchors it into the OM. The LptE core (top right panel) is composed of four β-strands and two α-helical segments. A bottom view (from the periplasm) of the complex is provided in the bottom panel. As observed previously, a potential LPS exit portal is located between β-strands 1 and 26 (in green in the top left panel) of the barrel wall. Mutant S. flexineri LptDE complexes with cysteine crosslinks engineered in these β-strands affected the viability upon expression in E. coli cells. This confirms their critical role in the functioning of the LPS exit portal (15). The opening of this portal is facilitated by a reduced number of main chain hydrogen bonds between β-strands 1 and 26 due to the presence of proline residues at position 231 and 246 in β-strands 1 and 2, respectively. Replacement of these prolines with alanine and subsequent expression of the LptDE variants in E. coli strongly impaired its viability. Presumably, these mutations prevent efficient opening of the LPS exit portal. Moreover, results from molecular dynamics simulations with wild-type LptDE and variants in which the proline residues were replaced with alanine support the importance of reducing hydrogen bonds between β-strands 1 and 26 in opening of the exit portal through locally disrupting the structure of these strands. In the current model for LPS assembly, LPS molecules are lined up in the LptC-LptA-LptD bridge that spans the periplasm and are transported along the bridge by ATP hydrolysis of LptB2FG. After the top most LPS molecule has been assembled into the OM, a new molecule is loaded on the bridge from the periplasmic face of the IM (14). 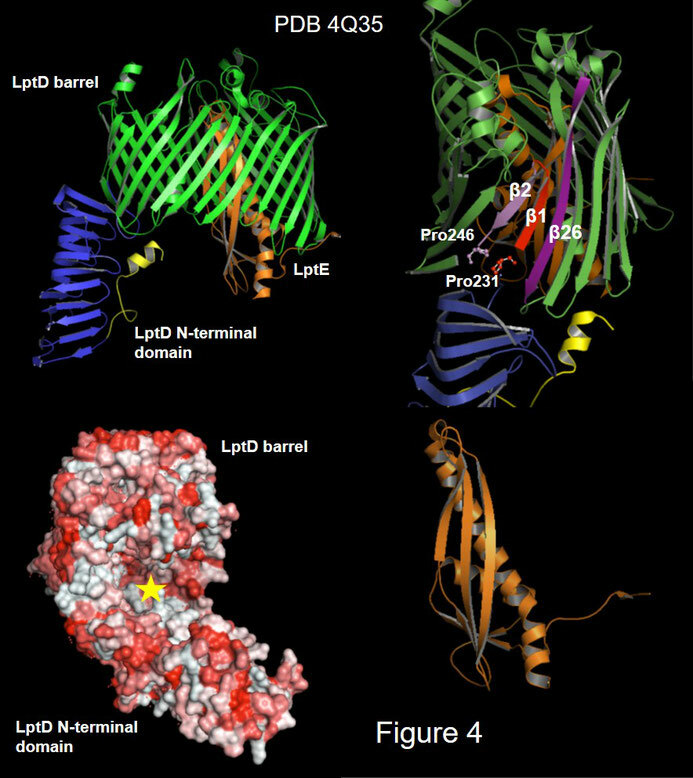 At the OM, LPS molecules are passed on from LptA to the N-terminal domain of LptD after which lipid A directly inserts into the OM while the hydrophilic part of LPS enters into the LptD barrel and is subsequently bound by LptE. Although the role of LptE is not fully understood, it is conceivable that it plays a role in opening of the barrel lumen to facilitate translocation of the carbohydrate moieties. Upon opening of the exit portal, formed by β1 and 26, the hydrophilic portion exits the barrel and is translocated to the extracellular surface (figure 6 adapted from 5). Direct evidence that LPS moves through the LptDE complex was recently provided by in vivo photo-cross linking studies (16). In these experiments, a UV-inducible probe was inserted at distinct positions of LptD and molecular contacts were mapped with LPS intermediates following activation of the probe. This showed that LPS initially contacts the N-terminal domain of LptD after which it passes through the intramembrane hole between the first and last β strand into the luminal gate that allows entry of the hydrophilic part into the inside of the barrel. 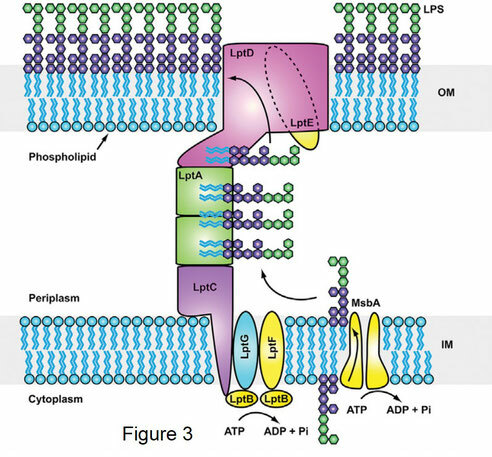 Next, LPS moves through the lumen of the LptD pore and finally leaves the complex through the exit portal, thereby contacting extracellular loops of Lpt to emerge at the bacterial cell surface. Although the structures discussed above have a provided significant insight in the molecular mechanism of LPS insertion into the OM. However, additional structures of Lpt proteins in different conformations and with various LPS translocation intermediates are highly welcome to answer remaining questions, such as, for example, the mechanism by LPS with its sizeable polysaccharide units is translocated across the periplasm. The cell surface of Gram-negative bacteria is decorated with LPS, a complex glycolipid, that is essential for cell viability of most of these organisms. LPS performs a crucial barrier function and protects the cell against harsh environments. Despite that it was first described in 1894, LPS remains one of the most intensely studied bacterial components. This because of several reasons, namely: its ability to elicit various biological responses e.g. induction of fever, its known chemical structure and the identification of its biosynthetic genes. 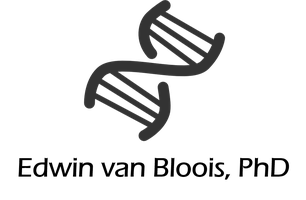 The sorting and assembly mechanism of LPS has been defined recently by complementary genetic and biochemical experiments. These have identified seven essential proteins – LptABCDEFG - that are required to transport LPS from the periplasmic face of the inner membrane to the OM (4). Interestingly, these proteins are not present in humans and are therefore attractive targets for the development of novel antimicrobial drugs. It can therefore be expected that the recently solved structures of Lpt proteins will aid in the design of novel antibiotics. In fact, two proteins involved in the biosynthesis and assembly of LPS have attracted attention as potential drug target, namely: LpxC and LptD (13). The first is a zinc-dependent enzyme that catalyzes a key step in the production of lipid A. Although many of the LpxC inhibitors have been patented and show promising pre-clinical data, none of these compounds has entered a clinical trial yet (17). Several compounds have been developed with promising antibiotic activity through inhibiting LpxC by chelating its zinc from the active site (REF). Additionally, a compound was discovered from a large library of peptides that is active against LptD. It was found that this peptide can be crosslinked to LptD in vivo. One of these peptides, Murepavadin, was tested with success in a pre-clinical study (18) and awaits further evaluation in a larger clinical trial. 2. Galdiero E, Kampanaraki A, Mignogna E, Galdiero M. (2012). Porins in the Inflammatory and Immunological Response Following Salmonella Infections, Salmonella - A Diversified Superbug, Mr. Yashwant Kumar (Ed. ), ISBN: 978-953-307-781-9. 3. Whitfield C1, Trent MS. 2014. Biosynthesis and export of bacterial lipopolysaccharides. Annu Rev Biochem. 83: 99-128. 4. Dong H, Tang X, Zhang Z, Dong C. 2017. Structural insight into lipopolysaccharide transport from the Gram-negative bacterial inner membrane to the outer membrane. Biochim Biophys Acta Mol Cell Biol Lipids. 1862: 1461-1467. 5. Qiao S, Luo Q, Zhao Y, Zhang XC, Huang Y. 2014. Structural basis for lipopolysaccharide insertion in the bacterial outer membrane. Nature. 511: 108-111. 6. Botos I, Majdalani N, Mayclin SJ, McCarthy JG, Lundquist K, Wojtowicz D, Barnard TJ, Gumbart JC, Buchanan SK. 2016. Structural and Functional Characterization of the LPS Transporter LptDE from Gram-Negative Pathogens. Structure. 24: 965-976. 7. Holst O, Ulmer AJ, Brade H, Flad HD, Rietschel ET. 1996. Biochemistry and cell biology of bacterial endotoxins. FEMS Immunol Med Microbiol. 16: 83-104. 8. Sampson BA, Misra R, Benson SA. 1989. Identification and characterization of a new gene of Escherichia coli K-12 involved in outer membrane permeability. Genetics. 122: 491-501. 9. Aono R, Negishi T, Aibe K, Inoue A, Horikoshi K. 1994. Mapping of organic solvent tolerance gene ostA in Escherichia coli K-12. Biosci Biotechnol Biochem. 58: 1231-1235. 10. Braun M, Silhavy TJ. 2002. Imp/OstA is required for cell envelope biogenesis in Escherichia coli. Mol Microbiol. 45: 1289-1302. 11. Bos MP, Tefsen B, Geurtsen J, Tommassen J. 2004. Identification of an outer membrane protein required for the transport of lipopolysaccharide to the bacterial cell surface. Proc Natl Acad Sci U S A. 101: 9417-9422. 12. Wu T, McCandlish AC, Gronenberg LS, Chng SS, Silhavy TJ, Kahne D. 2006. Identification of a protein complex that assembles lipopolysaccharide in the outer membrane of Escherichia coli. Proc Natl Acad Sci U S A. 103: 11754-11759. 13. May JM, Sherman DJ Simpson BW, Ruiz N, Kahne D. 2015. Lipopolysaccharide transport to the cell surface: periplasmic transport and assembly into the outer membrane. Philos Trans R Soc Lond B Biol Sci. 370(1679). pii: 20150027. 14. Botos I, Noinaj N, Buchanan SK. 2017. Insertion of proteins and lipopolysaccharide into the bacterial outer membrane. Philos Trans R Soc Lond B Biol Sci. 372(1726). pii: 20160224. 15. Dong H, Xiang Q, Gu Y, Wang Z, Paterson NG, Stansfeld PJ, He C, Zhang Y, Wang W, Dong C. 2014. Structural basis for outer membrane lipopolysaccharide insertion. Nature. 511: 52-56. 16. Li X, Gu Y, Dong H, Wang W, Dong C. 2015. Trapped lipopolysaccharide and LptD intermediates reveal lipopolysaccharide translocation steps across the Escherichia coli outer membrane. Sci Rep. 5: 11883. 17. Kalinin DV, Holl R. 2017. LpxC inhibitors: a patent review (2010-2016). Expert Opin Ther Pat. 27: 1227-1250. 18. Wach A, Dembowsky K, Dale GE. 2018. Pharmacokinetics and Safety of Intravenous Murepavadin Infusion in Healthy Adult Subjects Administered Single and Multiple Ascending Doses. Antimicrob Agents Chemother. 62(4). pii: e02355-17.